Ken Olsen, who cofounded Digital Equipment Corp. and built it into the second-largest computer company in the nation by creating small but powerful machines called minicomputers, died Sunday. He was 84, and his death was announced by Gordon College in Wenham, for which Mr. Olsen was a longtime trustee and benefactor. The college did not provide a cause of death or information about where Mr. Olsen was living. 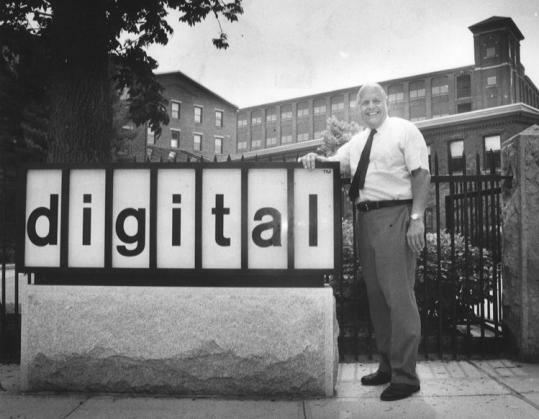 Mr. Olsen launched Digital in 1957 in a defunct woolen mill in Maynard with $70,000 in venture capital. For a time, Mr. Olsen, his partner, Harlan Anderson, and his brother Stanley Olsen were the company’s only employees. With innovation after innovation, Mr. Olsen and Digital helped create the computer industry. At one point, the company was valued at about $14 billion. In the 1960s, Digital pioneered a smaller, less- expensive alternative to the hulking mainframes that dominated the industry. Mainframes were usually run by specially-trained operators and were off-limits to everyone else. Users stood in line, handed over their computing tasks, then waited for minutes or hours for the results. But the minicomputers developed by Digital were so inexpensive that companies could buy several for scientists, engineers, or business managers, then let the workers use the computers themselves. Digital and Wang Laboratories, along with their spinoffs, were widely credited with playing a large role in the Massachusetts Miracle, the period of economic growth in the 1980s. Even when his own net worth was measured in the hundreds of millions, Mr. Olsen looked more like an engineer than an entrepreneur, favoring thick-soled work boots and preferring to drive a 1963 Ford Falcon because he admired its design and found it easy to maintain. Adjusting for inflation, Fortune said, Digital was bigger than Ford Motor Co. at the death of its founder, Henry Ford, and also larger than US Steel when Andrew Carnegie sold his company or Standard Oil when John D. Rockefeller stepped aside. Digital was second to IBM in the computer industry, though it was less than one-sixth of IBM’s size. Digital’s fortunes foundered when it was slow to enter the burgeoning personal computer market. Mr. Olsen stepped down as president in 1992 and resigned from the board a few months later, severing ties with the company. The company was acquired by Compaq Computer Corp. in 1998. “While I didn’t know him personally, I did know him as the founder of one of the Commonwealth’s and the country’s great companies and an example of our spirit of innovation,’’ Governor Deval Patrick said in a statement last night. Peter Zotto, who spent 23 years at Digital and was vice president of its European operations, called Mr. Olsen an excellent manager. Mr. Olsen delegated responsibility at Digital and was known for creating a decentralized management structure that became fodder for business textbooks. Gordon Bell, one of the key designers of Digital’s minicomputers, said Mr. Olsen’s style of management generated creativity and fierce loyalty. A Christian who for many years attended Boston’s Park Street Church, Mr. Olsen grew up in a household where his father taught Bible class and his mother played piano at a local church. For Mr. Olsen, faith was as important as his work. Kenneth Harry Olsen was born in Bridgeport, Conn., and grew up in the suburb of Stratford. His father held patents and designed equipment such as a safety-pin machine and one that made universal joints for cars. Mechanical even as a child, Mr. Olsen read technical manuals, rather than comic books. He began studying electrical engineering in the US Navy, which he joined in 1944, and continued his studies at the Massachusetts Institute of Technology. At MIT, he received a bachelor’s degree in 1950 and a master’s two years later, in electrical engineering. Afterward, he worked at Lincoln Laboratory until deciding to start his own company in 1957, getting seed money from the early venture capital firm American Research and Development Corp. The financial backers did not want the word computer in the company’s name, and Mr. Olsen settled on Digital Equipment Corp., or DEC. The company had sales of $94,000 in its first year. By 1977, when sales topped $1 billion, Digital had 36,000 employees. In 1986, a Wall Street Journal reporter interviewed Mr. Olsen in his office in the building that formerly housed a woolen mill and dated to the mid-1800s. One wall was given over to his collection of old computer parts. “They’re artifacts, like dinosaur bones,’’ he said. Mr. Olsen’s wife — the former Eeva-Liisa Aulikki Valve, whom he married in 1950 — died in 2009. Gordon College could provide no information on their children. A memorial service will be held at 2 p.m. May 14 at Gordon College. Marquard can be reached at bmarquard@globe.com; Bray at bray@globe.com.